BERLIN — German prosecutors said Wednesday that they have detained a Tunisian man they think may have been involved in last week's truck attack on a Christmas market in Berlin. The 40-year-old, who wasn't identified, was detained in Berlin during a search of his home and business, federal prosecutors said. The man's telephone number was saved in the cellphone of Anis Amri, a fellow Tunisian believed to have driven a truck into the market on Dec. 19. Amri, 24, was killed in a shootout with Italian police in a suburb of Milan early Friday. Of the new suspect, prosecutors said in a statement that "further investigations indicate that he may have been involved in the attack." Twelve people died and dozens more were injured in the truck attack. The Islamic State group has claimed responsibility. Prosecutors have until Thursday evening to determine whether the case against the 40-year-old is strong enough for them to seek a formal arrest warrant. That would allow them to keep him in custody pending possible charges. Investigators are trying to determine whether Amri had a support network in planning and carrying out the attack, and in fleeing Berlin. They're also trying to piece together the route he took from Berlin to Milan. Italian police have said Amri traveled through France, and French authorities said on Tuesday that he made a stop in the eastern French city of Lyon. On Wednesday, Dutch authorities said it appeared Amri first had fled through the Netherlands, Germany's western neighbor. Jirko Patist, a spokesman for the Dutch national prosecutor's office, said "highly likely" that Amri had been in Nijmegen, in the eastern Netherlands, during his journey from Berlin to Milan. Camera images recovered in Nijmagen "found someone we think, rather of whom we say it is highly likely," is the same person appearing in photos from Lyon in France, Patist told Netherlands public broadcaster NOS. Patist added that there was no reason to think the suspect was accompanied by anyone while in the Netherlands. A SIM card found on the fugitive after he was shot led authorities to the Netherlands. "We can see that the SIM cards like this have been distributed in several locations in the Netherlands," he said. Amri had no phone with him in Milan, only the loose SIM card. According to Italian police, Amri also had a pocket knife and a few hundred euros in cash in a backpack that he was carrying when officers on a routine patrol stopped him to ask for identification in the Milan suburb of Sesto San Giovanni on Friday. He also carried a .22 pistol that he then used to shoot a police officer, hitting him in the shoulder. The Italian investigator said the weapon appeared to be the same one used in Germany to kill the Polish driver of the truck that was commandeered for the Christmas market attack, but that final ballistic tests were still being carried out. The body of the Polish driver, Lukasz Urban, was returned to Poland on Tuesday, said Aldoma Lema, a spokeswoman for prosecutors in the Polish city of Szczecin. There has been speculation over whether Urban still was alive at the time of the attack and struggled with Amri. His body was found in the truck's cab. German daily Bild reported Tuesday, without citing sources, that autopsy results showed Urban was shot in the head several hours before the attack and would have been dead or unconscious by that time. Lema said she could not give the time of his death. Another autopsy was performed in Poland on Wednesday and preliminary findings won't be known for three weeks, she said. In Belgium, Interior Minister Jan Jambon said the apparent ease with which Amri traveled through Europe after the attack showed that passenger watch lists used to flag terror suspects should be extended from airplanes to other modes of public transportation, including buses. Jambon, who has said he wants the European Union to pursue the idea, told public broadcaster VRT that "the (passenger) information would need to be checked with lists of international terrorists that we have had warnings about. So, someone who is known or warned to be a violent extremist could be kicked off that transport." 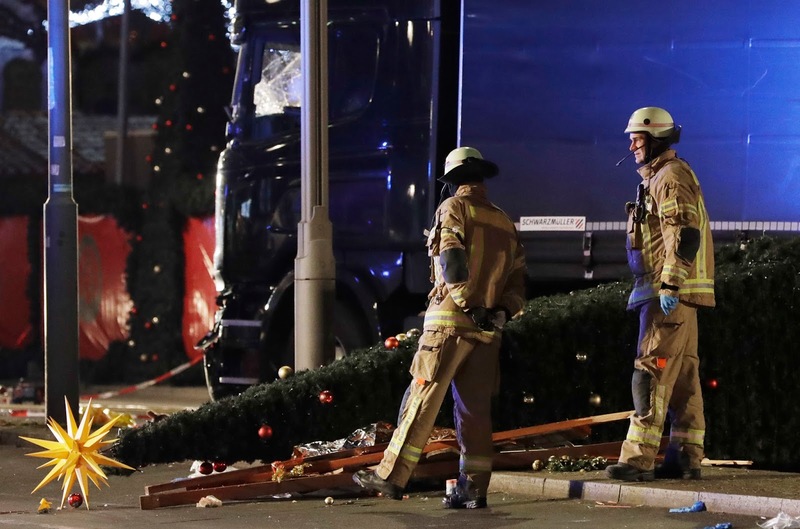 German media reported Wednesday that investigators believe an emergency braking system in the truck may have prevented more deaths. Daily Sueddeutsche Zeitung and public broadcaster NDR cited unnamed officials familiar with the investigation saying the tractor unit had a mechanism that automatically slams the brakes when a collision is detected. The news outlets also reported that Amri, whom German authorities had deemed a potential threat months before the attack, allegedly searched the internet for instructions on how to make explosives and first attempted to contact the Islamic State group in February. 0 Response to "Man suspected of ties to Berlin attacker detained in Germany"